Who was Sacajawea and why was she famous? Summary: Sacajawea (c.1786�12), also known as Sacagawea, was famous as a female Shoshone Indian guide and interpreter. She guided the Lewis and Clark expedition through the wilderness and across the Rockies from 1804�06. The following fact sheet contains interesting facts, background history and information about the life of Sacajawea and the events in history that led to her fame as a great Native American Indian. Sacajawea was famous as the Shoshone guide and interpreter for the Corps of Discovery led by Captain Meriwether Lewis and Second Lieutenant William Clark. The purpose of the Lewis and Clarke expedition (May 21, 1804 - September 23, 1806) was to explore the US lands obtained in the 1803 Louisiana Purchase and the Pacific Northwest. The Lewis and Clark Expedition traveled along the Missouri River from St. Louis to the mouth of the Columbia River. Sacajawea was an extremely unusual woman for her day. Back then, women were not revered in society. They were always considered to be the lesser gender when compared to men. They were expected to stay in the Indian camps under the protection of the men. Sacajawea was different and earned ever-lasting fame helping the Lewis and Clark expedition in search of the Pacific Ocean. Sacajawea was born around 1788 into an Indian tribe known as Shoshone, which in the English language is translated as the Snake People. She was believed to be the daughter of a Shoshone chieftain. At about the age of 10 years old, she was captured by a Hidatsa raiding party and taken from her home. In Hidatsa, her name is Tsi-ki-ka-wi-as, which meant Bird Woman, but in her native tongue which is the language used by the Snake People, Sacajawea meant Boat Pusher. She was treated as a slave and was sold to a French-Canadian trapper and fur trader. His name was Touissant Charbonneau. Sacajawea is just one of the two women he bought as slaves, who later became his wives. Her association with Charbonneau would change the course of her life, and led to her becoming one of the most famous icons in the history of Native Americans. 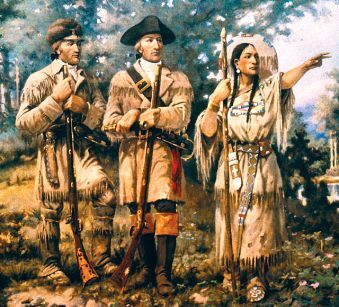 Sacajawea was in Fort Mandan when Meriwether Lewis and William Clark found them in search of a guide that can lead their expedition through the terrain in search of the Pacific Ocean. At that time, Sacajawea was just 16 years old and she was pregnant. Sacajawea was not supposed to be part of the expedition but Touissant Charbonneau insisted that she came with them. The expedition also thought that they could use Sacajawea to help with navigating and in interpreting. The group spent the winter in the fort first until her first born came into the world on February of 1805. The exact date of birth was not clear. The child was named Pomp, which in Shoshone meant First Born. His birth name was Jean Baptiste Charbonneau. Sacajawea took her first born along the expedition, who was strapped to her back in a cradleboard. On April 7, 1805, Sacajawea showed qualities which became her trade mark throughout the journey � calm and self-possessed. When their boat was going through the Missouri River, a storm hit the boat that the group was riding on. It keeled over and almost turned upside down. The men tried desperately to right the boat and gain the vessel抯 balance. Sacajawea on the other hand did not show any sign of panic. Instead, she tried to save every document and book that they had on the boat and wrapped it in waterproof cover. As a result, even when the documents and the books fell into the water, not one of them got wet. Sacajawea was held in high regard by the expedition members and was respected for being hardworking, intelligent and loyal. Sacajawea did not influence the direction that the expedition was going, except for that one time when they reached the grounds where her people, the Shoshone Indians, usually hunted. She advised the group to take the tributary road so that they can reach the land of her people. Once in the area, she was over-joyed, for it was the first she had seen of her people in a very long time. She received the news that her parents had died and that her brother, Cameahwait, had become the new chief of the Shoshone. With her plea, her brother agreed to sell some of the horses to the Lewis and Clark expedition and then they went on to continue their journey. According to records, Sacajawea never complained throughout the journey and the only time that she did was because she also wanted to see the great ocean and the whale which was washed up at shore. She claimed that she travelled far with the expedition and that she had the right to see what they traveled so far for. When they reached the shore, the whale was already all bones but the expedition were able to buy its blubber. After the expedition, Clark offered the couple to stay in St. Louis and live there near their apartment. In addition, Clark also offered to send Jean Baptiste to school, and they accepted. The both of them did not stay long though and went back to Fort Manuel. They left Jean in the care of Clark to continue his studies. The death of Sacajawea is full of mystery. Some reports say that she died of "putrid fever" bearing a female child, named Lizette, in Fort Manuel December 20, 1812 (aged 24). However the Shoshone Indians say that she was able to return to the tribe on the Wind River Reservation in Wyoming, and that she died in 1884. In 1925, Dr. Charles Eastman was hired by the Bureau of Indian Affairs to locate Sacagawea's remains and investigate her death. He went to the Wind River Reservation where he heard stories of a Shoshone woman with the Comanche name Porivo (chief woman). This woman had helped white men on a very long journey, and that she had a silver Jefferson peace medal of the type carried by the Lewis and Clark Expedition. It was Dr. Eastman's conclusion that Porivo was Sacagawea.